A few weeks ago I read, and reviewed, a book for Packt. As my reward I was given the choice of any book I’d like. At the time, there wasn’t anything that interested me. 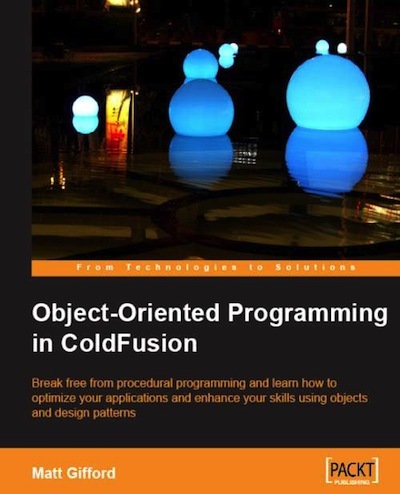 So I asked if I could give away a copy of Matt Gifford’s OO Programming in ColdFusion book and was told that would be fine. So… to keep this nice and simple, here is how the giveaway will work. Post a comment (ensure you use your real email address, only I will see it) that answers this question: “The only thing that would make a movie with robots and giant monsters better would be ….” Don’t stress too much over this as I’ll be picking a winner by random selection, but you must answer the question. I’ll pick a winner Wednesday. Enjoy.